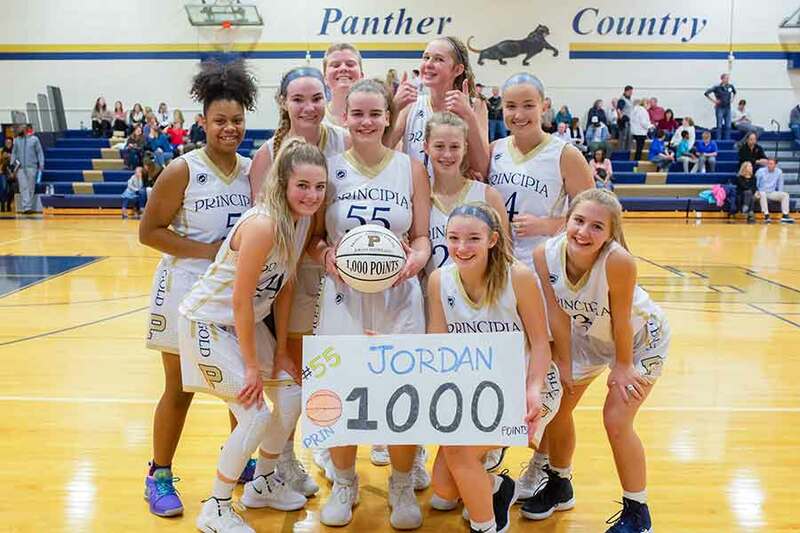 On January 18, Jordan became the first Principia Upper School girl to reach 1,000 points as a junior—in breathtaking fashion, on a free throw in the final minute of the game! “I realize how special this accomplishment is, and I am grateful for all my coaches and teammates who have inspired me and supported me,” she says. After her freshman year—during which Jordan set Principia records for highest freshman scoring and rebounds—she worked intensively in the off season. Her goal was to make 20,000 shots before her sophomore season began, but she ended up making 22,500. Her scoring average per game rose from 8.1 points her freshman year to 17.3 her sophomore year. It’s approximately 21 per game this season. Jordan is the eighth Upper School girl to have scored 1,000 points—and the first to do so as a junior. She follows Sarah (Corbitt) Banning who reached the milestone in 2009, Liz Gilman and Kara Johnson (2012), Alli Ball (2013), Caitlyn Demaree (2016), and Kate Hinds and Cameron Bania (2018).